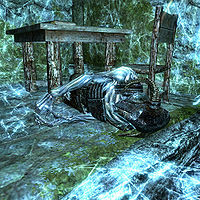 Japhet is a draugr whose remains can be found in the basement of Japhet's Folly. Long ago, Japhet was the son of a farmer who set out with a small company of men from Dawnstar to create a fortress on a small island near Windhelm, an island that would come to be called Japhet's Folly. According to Japhet's Journal, his followers left him one by one, but he refused to give up, and instead resorted to eating ice moss when farming proved impossible. He eventually died, convinced that the local rumors about ghosts had been right all along. This page was last modified on 17 February 2018, at 23:44.